Can the Chinese and US Air Forces Get Along? Policymakers from both states should pay close attention to the prospect of maintaining ties between their air forces. 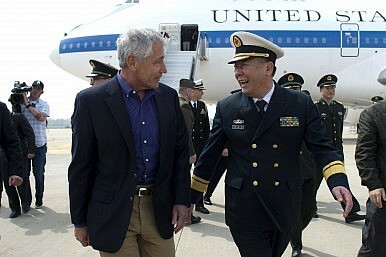 Secretary of Defense Chuck Hagel’s visit to the PLAN aircraft carrier Liaoning has received a great deal of attention in the last few days. As Shannon Tiezzi points out, Hagel will struggle to improve ties with Beijing while also increasing coordination with Tokyo. And yet the project of engaging with the Chinese military is not the same as making friends with it. Because effective communication requires shared priors, China and the United States both have an interest in developing a common understanding of military problems and capabilities. U.S. Air Force Chief of Staff Mark Welsh and General Hawk Carlisle displayed a deft understanding of this dynamic in an article in the January-February 2014 issue of Air and Space Power Journal, which recounted the two officers’ recent visit to China. The visit was conducted mostly at the strategic and institutional level, giving the USAF leaders an appreciation for how the PLAAF understood the role of airpower in Chinese history. While the visit displayed only some of the PLAAF’s most modern technologies, it did serve to highlight the institutional reforms that drive improvements in Chinese capabilities. The history of the relationship between the PLAAF and the USAF is complex. The Korean War looms large in the history of both services, representing the first real test that either faced. The relationship eased after Nixon’s 1972 visit to China, with the USAF supplying update kits for several older Chinese fighter types and exchanging intelligence with the PLAAF on Soviet dispositions and capabilities. Also in the 1970s, China exported a group of J-7 fighters to the United States in order to support the latter’s “Red Eagle” MIG squadron. These fighters so faithfully copied their Soviet models that they reproduced several production errors that American engineers later had to correct. As the Cold War faded, the security relationship between the USAF and PLAAF deteriorated, even as Chinese capabilities increased. But as Welsh and Carlisle suggest, it remains possible to envision a positive-sum outcome to building a cordial, communicative relationship between the services. Increasing engagement with every branch of the Chinese military holds the promise of avoiding, or at least mitigating, the worst aspects of crisis diplomacy. And as Harry Kazianis argues, this requires some transparency with respect to the Chinese capabilities that the United States fears the most. Indeed, Chinese efforts to deter U.S. military action depend on a strong degree of American awareness of Chinese capabilities. Civilian and military policymakers from both China and the United States should pay close attention to the prospect of maintaining good relationships between the military service counterparts, even as those services develop capabilities for fighting one another.